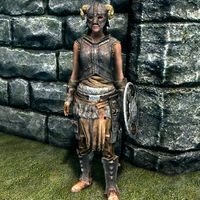 Iron weapons and heavy armor are commonplace, low-quality items, crafted out of iron ingots, which can be mined at any of hundreds of ore veins scattered across Skyrim. 3 Iron Ores are obtained by mining Iron Ore Veins. Can be purchased at all levels. 1 Iron Ingot is obtained by smelting 1 Iron Ore (this is the only case where only one ore is required to make an ingot). Can be purchased at all levels. 1 Steel Ingot is obtained by smelting 1 Iron Ore and 1 Corundum Ore.
Iron Smithing is available from the start of the game, without any Smithing perks. 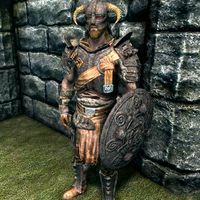 Iron Armor is level 1 Heavy Armor, made from Iron Ingots and Leather Strips. Iron weapons are level 1 weapons, made from Iron Ingots and Leather Strips. Iron Ingots are always sold by all blacksmith merchants, at all levels. Iron Ingots may be sold by general goods merchants at all levels. Iron Ore may be sold by blacksmiths and general goods merchants at all levels. There are a total of 668 veins, 81 ores, and 275 ingots available in the game. 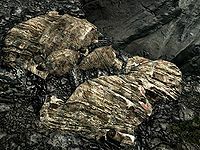 Individual iron ore vein outcroppings are found scattered everywhere across Skyrim. Only particularly notable locations are included in the following list, including places where large amount of the metal may be found and places that are particularly easy to access. The Iron Veins category contains a more complete list of places containing smaller numbers of veins. All exterior ore veins are shown on (map). Note, however, that only 50 veins are shown on the map at one time; to see the next set of 50 veins, click on "Next" at the bottom of the list of results. Given the high density of iron veins on the map, a more efficient way to find veins near your current location is to not use the search feature, but instead simply zoom in at your current location on the map. Veins are shown at either of the two highest zoom levels. Haafingar Solitude Blacksmith 5 27 3 Ores and 4 Ingots are outside the building; the others are all inside. Haafingar East Empire Company Warehouse 3 15 In the hold of the Red Wave. The Rift Northwind Mine 3 With USLEEP, these will all be changed to ebony, swapped with Redbelly Mine. Whiterun Hold Riverwood 5 At Alvor's work area. The Reach Understone Keep 4 1 At Moth gro-Bagol's work area. Iron items can be forged from the start of the game, without the need to unlock any Smithing perks. This also means that only normal-level tempering of iron items is possible (there is no perk that provides the ability to "improve them twice as much"). 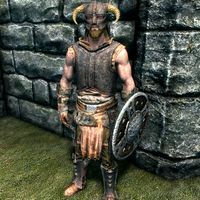 Iron Armor is the lowest-quality heavy armor in the game, and appears in leveled lists from the start of the game. All items can be tempered using 1 Iron Ingot. 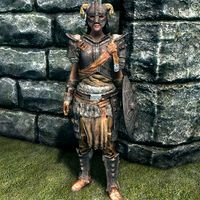 Banded Iron Armor is marginally better quality heavy armor than standard Iron Armor, and also appears in leveled lists from the start of the game. One drawback of Banded Iron armor is that only a cuirass and shield are available, meaning that it is impossible to create a Matching Set of Banded Iron armor (Patch 1.9 later addressed this bug). Both items can be tempered using 1 Corundum Ingot. Iron weapons are the lowest-quality weapons in the game, and appear in leveled lists from the start of the game. All items except ammunition can be tempered using 1 Iron Ingot. Arrows can only be smithed if the Dawnguard add-on has been installed. There is no "Iron Bow", only Iron Arrows. The bow found at similar levels is the Long Bow, which cannot be crafted but can be improved with firewood. Iron Ore can be transmuted into Silver Ore, which in turn can be transmuted into Gold Ore.
Iron Ore can be sold to Beitild, Gestur Rockbreaker, Grogmar gro-Burzag, Skaggi Scar-Face, or Thorgar for the quest Mine Ore. Note that these people will pay you 7 gold (instead of 2 gold) for each ore.
Iron Ingots are needed when forging all varieties of Iron, Steel, Orcish, Dwarven, Elven, Ancient Nord, and Dragonscale armor and weapons. 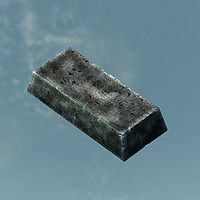 1 Iron Ingot is needed at Workbenches to improve all varieties of Iron armor (except Banded Iron armor and Banded Iron shields, which require 1 Corundum ingot), Ancient Nord armor, guards' armor, and numerous unique items and artifacts. 1 Iron Ingot is needed at Grindstones to improve all varieties of Iron weapons, as well as numerous unique items and artifacts. Ore veins of all types sometimes do not respawn normally. See Mining bugs. HF All crafted housebuilding items use Iron Ingots in their creation, and many items built at carpenter's workbenches also require them. Due to a cross-promotion between Bethesda Game Studios and Valve, in the game Team Fortress 2 the Iron Helmet appeared as the "Dragonborn Helmet". This page was last modified on 3 May 2018, at 12:32.